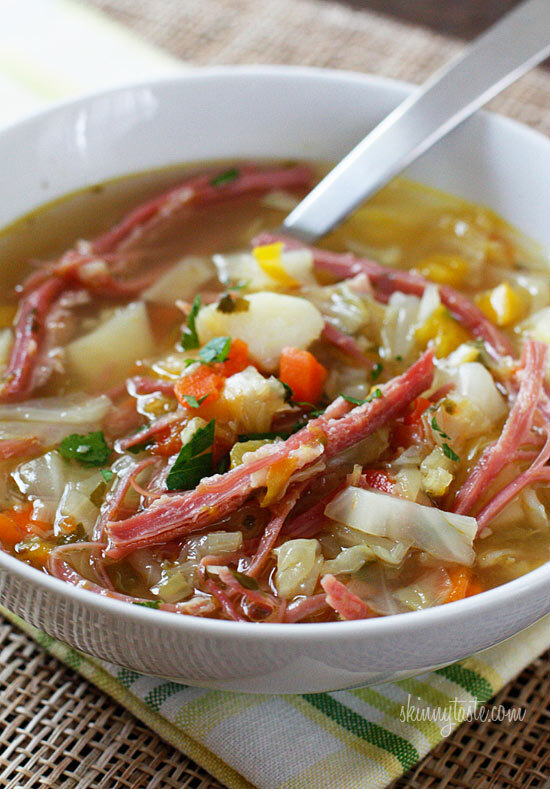 Original recipe from Skinny Taste: http://www.skinnytaste.com/2012/03/corned-beef-and-cabbage-soup.html Cook 2 1/2 pound corned beef (uncooked without fat = 2 pounds; cooked =18 ounces). Use half for soup. Reserve 9 ounces for second meal. Makes 9 cups. In a large pot or Dutch oven, heat oil over medium low heat. Add leeks and sauté until soft, about 4-5 minutes; add garlic, carrots and celery and sauté about 2-3 minutes. Add corned beef, peppercorns or seasoning packet that comes with the corned beef, water and bay leaves; cover and bring to a boil. Simmer covered on low heat for 3 hours, until the meat becomes tender. Remove the corned beef, set it on a cutting board and shred with a fork. Return it to the pot then add the cabbage, potatoes and half the yellow pepper. Cook until the vegetables are tender, about 30 more minutes. Add the celery and the rest of the yellow pepper and cook for another 15 minutes. Taste for salt and pepper and adjust as needed..